Drying lumber at temperatures above the boiling point of water is not a new process. In 1867 a patent was granted in the United States for "Apparatus for Drying and Seasoning Lumber by Superheated Steam." 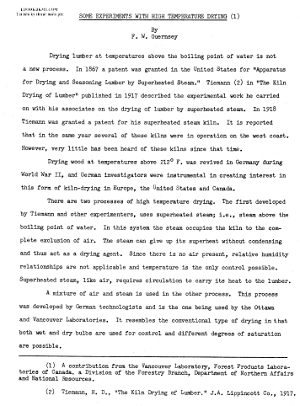 Tiemann (2) in "The Kiln Drying of Lumber" published in 1917 described the experimental work he carried on with his associates on the drying of lumber by superheated steam. In 1918 Tiemann was granted a patent for his superheated steam kiln. It is reported that in the same year several of these kilns were in operation on the west coast. However, very little has been heard of these kilns since that time.